12-24 hours of operation. Med/lg room size. 1.0 gallon capacity. 3 year warranty. CVS Health pharmacist recommended. Up to 96% bacteria-free mist (Based on Independent Laboratory Intertek-ETL Test Report testing No. 3120389-COL-001. Results are based on reduction of the following bacteria after 2 hours of continuous use: E. coli showed up to a 96.4% reduction; S. epidermis showed up to a 95.5% reduction; P fluorescens showed up to a 95.2% reduction. EPA Establishment number 071422-CHN-001). Warm mist helps relieve cold & cough symptoms. Restores pure, natural moisture. Medication chamber for inhalants. 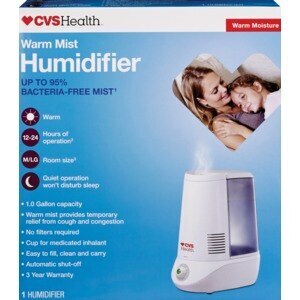 How it Works: CVS Health Warm Mist Humidifier provides a soothing warm mist to help relieve cough and cold symptoms. Operation is whisper quiet and won't disturb sleep. Easy to grip handle for easy carrying. The steam vapor mixes with dry air in the cooling chamber. Water flows from the water tank into boiling chamber where it is heated. Up to 96% bacteria-free (Based on Independent Laboratory Intertek-ETL Test Report testing No. 3120389-COL-001. Results are based on reduction of the following bacteria after 2 hours of continuous use: E. coli showed up to a 96.4% reduction; S. epidermis showed up to a 95.5% reduction; P fluorescens showed up to a 95.2% reduction. EPA Establishment number 071422-CHN-001) mist is quietly emitted into the air. No white dust. Translucent water tank. 1 gallon of capacity, up to 24 hours of operation per filling. Locked boiling chamber heater features a non-stick coating for easier cleaning. Two output settings for maximum moisture or moisture maintenance and built-in nightlight. Easy to fill, clean & carry. Automatic shut-off. Ideal for nursery. Healthy Living with Vapor Therapy: Water is one element that all forms of life must have to survive. All functions of your body require sufficient moisture to work properly. When your body does not have sufficient moisture, it functions poorly. Dry, arid climatic conditions are usually the culprit. Colds and flu can further cause dehydration. Colds and flu begin making their seasonal rounds during fall and winter. Part of the reason for increased respiratory illnesses during this time is because the humidity level in the air reaches its yearly lows. Central heating units in homes and offices further remove moisture from the air. The relative humidity may drop to as low as 10% - drier than the air in the Sahara Desert. Most people experience problems when the relative humidity drops below 25%. A comfortable humidity level should not be higher than 50%. Humidifiers help prevent this excessive dryness, providing these benefits: Helps relieve congestion and coughs by keeping the throat and nasal passages hydrated. Helps you breathe better and sleep more comfortably. Helps provide relief for dry eyes, dry nose, flakey skin, chapped lips, and general indoor air discomfort. Helps reduce static electricity. Stops dry out damage to plants, paintings and furniture. Saves you money on heating bills, since proper humidity lets you feel more comfortable at lower temperatures. 2 settings - two moisture settings. Quiet - quietly disperses a pure mist. Easy-to-fill - Water chamber has large lock-tight leak proof opening. Light - large night light. Convenient - Built-in medication chamber for inhalants. C UL US listed. CVS Health quality. Made in China. Keep out of the reach of children. Carefully supervise young children when the vaporizer is operating. This unit produces hot steam and could cause burns.